The health and life expectancy of the population of 534,000 in Buckinghamshire is generally better than the England average. However, in the most deprived areas people will die on average up to 5.4 years earlier than those in the least deprived areas. The population is expected to grow by 12 per cent by 2030 (with increases of 39 per cent in people aged 65+ and 78 per cent aged 85+). Unhealthy lifestyles present a major challenge for the population’s health and future demand for services. 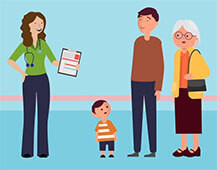 The Buckinghamshire integrated care system is committed to creating ‘one Buckinghamshire, one integrated health and care system’, working together under the banner of ‘Your community, your care: Developing Buckinghamshire together’. This will be delivered through more joined-up care close to home, making it easier for people to get urgent care when they need it, improving and simplifying care for diabetes and musculoskeletal problems, improving access to mental health services and improving the prevention, diagnosis and treatment of cancer. Staff will have opportunities to develop professional skills through working in a range of settings.